The first time I ever heard of anyone eating Butter Chicken it sounded like something nobody should eat! I imagined something completely different than what was put on the table. Boy was I wrong! And cauliflower. To think I gave you no respect before my Keto life. It was one of those big deal veggies. You boil it, it can get mushy and does it even have any flavor? All that changed when I discovered Cauliflower Puree. Oh, how I love it now! 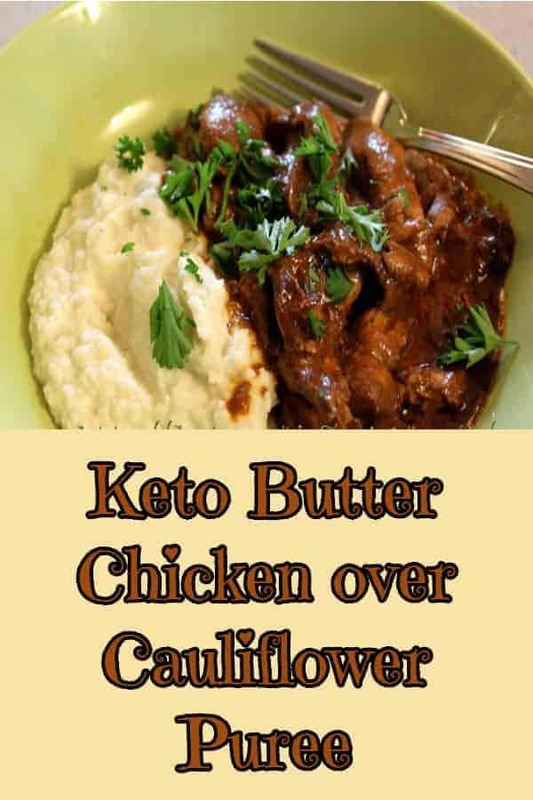 Put these two things together and you have one of my very favorite keto comfort food dinners! Break up the cauliflower into chunks and boil or steam until fork tender but not mushy. Drain and toss into a food processor (or blender) with the butter and cream. Process. I have made this in both my KitchenAid Food Processor as well as my Vitamix and both worked out perfectly. Looks and tastes like mashed potatoes! Now, about that Butter Chicken to put on top. I always use leftover chicken thighs when I make this, so I am just giving you the sauce recipe. In a large skillet, heat coconut oil. Add onion and saute until transparent. Add garlic and all the spices and stir until thick. Add the tomato paste and stir. Add the coconut milk and salt with a whisk until well blended. Add in the cooked chicken and simmer for a few minutes until chicken is hot. Stir in the butter until it is melted. Serve over the Cauliflower Puree. Calories 305, Fat 23, Protein 17, Carbs 7, Fibre 1 for a ratio of 68/23/9. 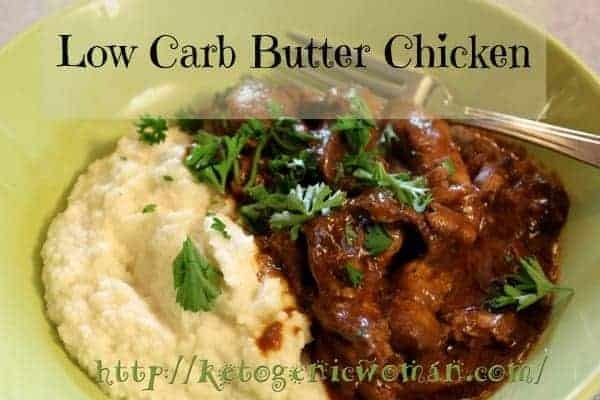 Tagged butter chicken, cauliflower, chicken, comfort food, gluten free, keto recipes, ketogenic recipes, LCHF, low carb, puree, what to eat on ketogenic. Bookmark the permalink. This is yummy good!!! Thanks for making keto interesting!! I would use about 1 chicken thigh per serving. Hope that helps! Yes I updated the post (see near the bottom) and sorry for the delay! Thanks! I added it to My Fitness Pal under “Ketogenic Woman Butter Chicken” FYI 🙂 Hope that’s ok! I know lots of Keto/ Paleo people seem to use this tool as well!!! The only think I wasn’t 100% sure of is what a serving is for this one … one cup, two cups, less??? Hmmm, I’ve never actually measured it out cup wise. I think on MFP you can enter # of servings, which in this case I have made it 6 servings. Sorry, I’m not sure how I missed your comment! I will figure out the nutrients and update the post within the next 24 hours. I updated the post (see near the bottom) and sorry for the delay! I get the taste right, but my butter chicken sauce is so thick! Any suggestions? Maybe add either some chicken broth or coconut milk? Or less tomato paste. The sauce is thick, but when I add chicken thighs (with skin), it seems to get thinner. Better answer! I had this problem the other day and I added more butter! It is BUTTER chicken, don’t know why I didn’t think of that right away! That is music to my ears! i work full time and if I have to slave over it, it’s not happening! Thanks for visiting! I made this tonight, it was really good. I think I might prefer to try it with cauliflower rice next time though. Thanks for the recipe. Thanks so much for letting me know that you liked it. I was thinking of trying it over cauliflower rice as well. I think it will be good that way. I will be going to the store in the morning for these ingredients. This look divine and I CANNOT wait to try it! Thank you so much for sharing! I dont eat cauliflower often but this dish might make me eat it more! Definitely a winner! I could just imagine the mixture of mashed potatoes with this viand! Sounds delicious! I have made mashed cauliflower in place of mashed potatoes before and they were delicious! This really looks delicious. I do like cauliflower but mostly eat it raw. I would like to try this. Wow, sounds too good ! I will try it with Beef Stroganoff for sure. I happen to like cauliflower but generally just throw some Italian breadcrumbs over it–never ever thought about mashing it up! What a great idea! I never would have thought of this before, but honestly it sounds really quite good! This is a wonderful way to cut carbs. These are so much like mashed potatoes! This post couldn’t have come at a better time. It definitely has been on my mind lately to start substituting mashed potatoes for mashed cauliflower to decrease the carbohydrate consumption. I love this recipe. Then you must try it! I was so surprised at just how good it was! I love this unique recipe! My hubby had a cauliflower puree at Yosemite a few years ago and still talks about it. Can’t wait to make this for him. Yes, it’s my new love! My brain is working overtime with all the possibilities!